Antique Sterling Silver Trays are not only beautiful and a classic accessory to your home, but they can actually be very valuable at auction. Sterling Silver Trays don't really come into production until the late 18th century but have become quite popular. 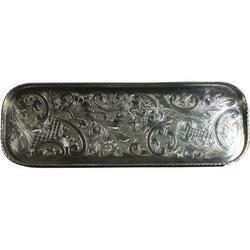 Normally Antique Sterling Trays are designed with two handles and can be up to two feet in length. If your tray doesn't have handles, you may have what is called a Salver, which are very rare as most of them perished in the English Civil War. Buy and Sell Gorgeous Looking Sterling Silver Trays At The Best Price From Antique Silver It was not long ago, when people in higher sections of society served food on silver trays. 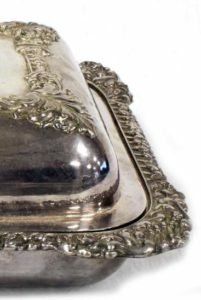 Gorgeous silver trays were the highlight of social gatherings and dinners given by the rich and wealthy. Over the years, the practice has been discontinued. 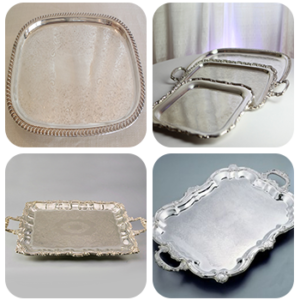 Nevertheless, Silver trays are still used in many families, so much so that they are kept as heirlooms. If you are seeking such items for your personal collection, look into Antique Silver. We are Vintage Silver trays collectors and stock pieces that are worth their weight in silver and are truly precious to own. Our store has pieces that exhibit the finest craftsmanship and best quality. You will find them a perfect complement to your existing dinner set items and they are spectacular to show off to guests, particularly when you are inviting important people over for lunch or dinner. We are the most reputed silver trays buyers and offer them at the best prices, giving you quality items at a rate that is a reflection of their real value. As with all silver antiques, it's important to know the purity of your antique when determining a potential value for sale. There are many Hallmarks, or Silver Marks, which can indicated which it is that you have. Most commonly, Sterling Silver is marked with the numbers, "925." Indicating a 92.5% silver purity. Silver Plated Antiques may be marked with the letters, "EPNS" or "EPBM." Unlike Sterling Silver Tea Pots, which are generally very thin, Antique Silver Trays have the potential of being relatively heavy which increases their Silver Value. What's The Value Of My Silver Tray? Silver Trays lose value as they become more damaged. Check your tray for bumps or imperfections. You may also notice repair has been done on it in some places. Evidence of soldering may also be a sign of forgery or imitation. Looking for patterning on your tray can help identify date and style. Some Antique Silver Trays have a silver rope twist around the border it could be from the early 19th century - and fetch a very good price, as well. Trays with sharp lines and angles tend to be from the late 20th century art deco period and tend to be less valuable. The Uniqueness, Quality, Manufacturer and History of any antique also play a significant role in determining value. When you're ready to really discover what you've got, we'd love to hear from you. Our appraisals are 100% accurate and we buy silver trays and other antiques at the best price in Florida.